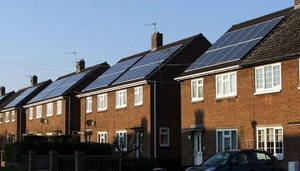 Use of Solar Power nearly doubles due to energy price increase. Energy prices are going up. This is because we are becoming more energy efficient as a country, with Government schemes, such as the Green Deal, which helps improve our homes to make them more energy efficient. With this is mind businesses are rising the price per unit of energy and in response to this Solar Power has almost doubled in the last year. Over 650,000 installations ranging from solar farms to panelling on domestic rooftops. The solar industry has said there is now enough solar panels to power roughly 1.5million homes. There are a few ways to install Solar Panels, from buying them outright, attaining them through the Green Deal and the rent-a-roof scheme whereby companies install the system free in return for pocketing payments for the surplus energy that is fed into the National Grid. Of the homeowners who have solar panels on their roofs, seven out of ten paid for them themselves and only a fifth used the 'rent-a-roof' scheme.